Understanding yourself as a learner is a key to success. Knowing when and how to apply different modes of thinking to different situations is a learned skill. At Hobsonville Point Secondary School, one of the focuses of our hub curriculum this term is around building the students’ capacity to understand themselves as learners. 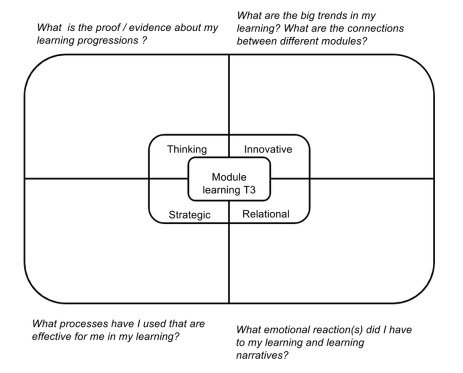 We are using a variation of Ned Herrmann’s Whole Brain model as a means of unpacking the students’ learning preferences. While we had introduced the students to the model earlier last year, it was definitely time to come back and delve a little deeper. In term 4, students across the school were empowered with some understanding of the parts of the brain, what they do and how this may link to our learning preferences. This was a bit of a stretch for me to prepare for the learning coaches to use as I had to make sure that my understanding was deep enough it so I could translate it for others to use. Using terms like ‘limbic system’, ‘cerebral cortex’ and ‘corpus callosum’ is far removed from my drama/classics teaching experience so I was thankful for one of our biology teachers looking over the presentation beforehand. can we combine our thinking quadrants to use them together? can we learn to think in each mode? what part of the brain covers addition or bad behaviour? What happens when one part of the brain doesn’t work anymore? Can we tie autism to the parts of the brain? We talked through the whole brain model and the brain for about 40 minutes. I love that the students in my learning community are hooked on knowing and understanding more. One of the focuses of our school is on empowering students and I think that understanding how they think and how the brain works is essential – there were so many students hanging back during their break to ask more questions. In our community we built on the thinking quadrants in our extended hub community time. The students had to refamiliarise themselves with the quadrants, but this time focus on the common attributes of each thinking mode, expectations held by people when that mode is their preference, and what each quadrant struggles with. 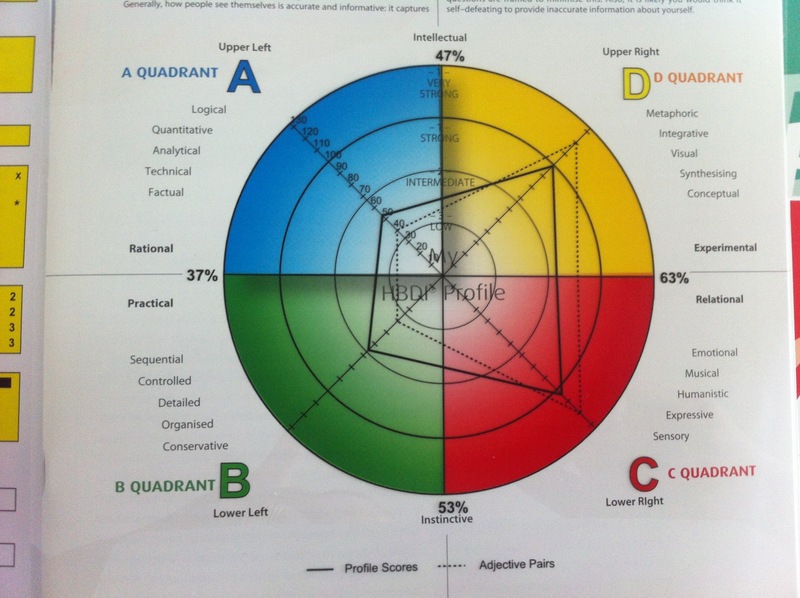 There was a cut and paste collaborative activity to get the students used to using the language of the quadrants, their descriptors, strengths when using that mode of thinking, as well as what each quadrant struggles with. Then the learning coaches offered a different activity for each of the thinking quadrants. The catch… we had to plan an activity which would challenge us to work with our least preferred thinking quadrant. Steve worked with the strategic quadrant (green), Bryce worked with the innovative quadrant (yellow), Danielle with the red quadrant (relational) and I had the blue quadrant (thinking). I found this really challenging. As a learner. For me, the whole point of the preferences is that this mode of thinking is not what I would normally be drawn to. So I had to really think about what types of things I wanted the students to engage with – being analytical by dealing the specific information in a logical manner. Making connections between ideas to draw some kind of conclusion. I thought about it all weekend. And it was only on Sunday night that I decided to use some ponderous riddles for the students to analyse facts to come up with an evidence based conclusion. Upon reflection, I realised that this activity was really successful. Thankfully, the feedback from the coaches involved was also positive. Each of us had to work outside of our comfort-zones, which is always unnerving – and I was so thrilled to see the students actively engaging with some different modes of thinking. Our coaches’ debrief included us noticing how some students used different strategies to deal with the problem presented, the Hobsonville Habits that we could see visibly in their learning, and the types of questions asked. The new year has arrived and my role at HPSS is slightly different this year, as I am not leading Taheretikitiki community due to my secondment. However, I still want to consider how to empower the students to understand themselves as learners, to move beyond their preferences and to make this aspect of thinking more visible in the school. I’m working my way through Ned Herrmann’s Whole Brain Business book and while the context tailored to the corporate world, as indicated by the title, I’m busy transferring to what it looks like in the classroom /school context. I’m excited about the communication and creativity sections – lots of scope there to tie into growth mindsets and Hobsonville Habits. Reflecting on information about learning is a key part of metacognition. Getting any information (written or oral comments, or grades of any kind) is not in itself that useful – learners have to do something with it. Our students at HPSS reflect, a lot. And the problem with doing anything, a lot, is that it can be seen as something repetitive or burdensome if it is always done in the same way. Our students have just finished a term’s learning. In their modules. 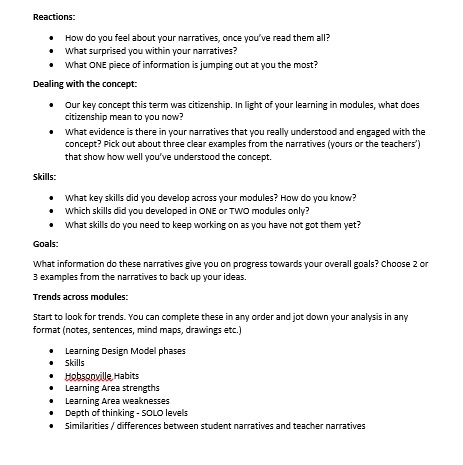 Teachers and students have constructed feedback through ongoing narratives documents which show where the are going, how going, and where to next in their learning. For each of their learning modules. And they have 6. As learning coaches, part of our job is to bring the learning together with our students, to have a holistic view of them as learners. When we were at this same point last term, we got the students to compare their commentary with their teachers in each module and then reflect on it. This did not bode well for a holistic overview but instead gave disjointed snapshots. I wanted to get away from comparing their voice and their teachers to one thing that is a bit more robust, and to definitely move away from the groans when the students were asked to write yet another reflection. So I needed to rebrand the approach, and for the rebranding to be effective as this approach was going to be offered to all learning coaches to use with their learning hub students. Watching CSI was my inspiration. Instead of reflecting, what if thy were detecting? Searching for clues that would lead them somewhere. From that random thought came the activity below. If I had more time to develop it, I would have pushed the “detective” angle further – instead of questions there could be clues, suspects and evidence. The students pulled this information into a tool based on the Hermann’s Brain whole brain model – as we are looking toward developing our learner profiles using the whole brain model. All students (or at least all I could see when walking around) completed this activity on Friday morning at HPSS. In the 90 minute learning hub time, students were engaged for the whole time. There we no groans and they took the activity really seriously. Students in my learning community (Taheretikitiki) asked if they could keep working on it in our next extended hub time. Many coaches, from all of the learning communities, commented on how gripping a task it was for students. Our next move is for the students to meet with their learning coaches to use this self-assessment and ‘detective’ reflection to readjust or re-evaluate their goals and strategies to meet them. I would be keen to find out more about why this approach of reflecting (looking back on learning to look forward) was received by both students and staff so much more positively than written reflections in the past. The third week of my journey covers reflection, brain exploration and taking values into practice. At the end of last week I shared my story with the staff about my learning journey and values which have shaped my life. I spent a lot of time thinking about my life, the learning experiences, challenges I faced and how I overcame them. This level of reflection wasn’t part of my usual daily routine and I found the process to be very emotional. So many aspects of the vision of Hobsonville Point resonate with me as my life would have turned out quite differently had I not been in a school were there was sufficient flexibility to allow me to take a slightly different route and personalise my learning. I found sharing my story to be very difficult – there were lots of tears (from me and others) but I kept coming back to why I believe that learning needs to be personalised – if Kavanagh hadn’t been so open, I would have left school with my highest qualification as 4 subjects School C. Now, I have just finished my masters and am in line for first class honours. I love hearing the stories of everyone at Hobsonville. There are moments of connectedness, shared experiences (especially when looking at old photos) and the sense that we are coming together as a team. I look forward to more stories today and tomorrow. So, after that cathartic experience, we spent the beginning of the week with Julia Atken looking at learning preferences and the brain. We had all completed a Herrmann’s Brain diagnostic test earlier in the term and Julia took us through our results and the implications of our results. This was a really interesting process. As a team we had to select dispositions or qualities from a set of cards which most reflected ourselves. Julia put limitations on these so that we had to make a choice of three cards, with the option of one which did not reflect us at all. I felt that I wanted to pick a card which reflected an emotional way of thinking but instead chose my three descriptors as ‘flexible’, ‘challenging’ and ‘planner’ – my non-me card was ‘quantitative’. I was quite pleased with my choices but not at all surprised to see that my Herrmann’s brain diagnosis placed me as mainly holistic/ emotional in my thinking/learning preferences, followed by a practical approach with rational thinking as my least preferred mode. This correlates to my Myers-Briggs personality profile – ENFP. I think big picture with an emotional slant – innovation, imagining, risk-taking balanced out with structured, logical and conservative approaches – kind of like my three words. It was great to compare and contrast our diagrams with the team – as a group we have common traits but there is diversity. I really loved the openness with which everyone shared their diagrams, their interpretations of them and the acknowledgement of our shared differences. I see real potential in how we use this information about our thinking preferences – both in terms of leading learning (for students and staff) but also in how we work closely alongside students to personalise learning. Personalisation does not have to be about making student’s passions the focus of their learning but instead could be about knowing preferences and challenging learners to develop their least preferred option. I also love that it doesn’t label someone as ‘being’ blue or yellow or red… or whatever. Instead, it acknowledges preferences. The diagnosis also covers how you are likely to think when under pressure – no surprises for me that my rational and practical ways of thinking take a backseat to a more emotional response. However, the only thing which proved to be a surprise was that I was more likely to be an experimental thinker under pressure – future focused. This would come as no surprise to my poor husband who sees me as the eternal optimist, particularly when under duress. Tuesday and Wednesday has had the Leaders of Learning working on developing the ‘Hobsonville Habits’. These are the practices and principles which will underpin everything that we do. This has been a great academic exercise where we developed ‘I’ statements about what those habits may look like – e.g. ‘I stay firm to my resolve’ as a habit which underpins resilience. I have really enjoyed the robust discussion around these – not only as I love discussion and dialogue – but we are hopefully more mindful of the thinking preferences approaches we as a LOL team possess. I love that we have time to debate and discuss the semantics of these (I am passionate about language and the power of words) but that this is balanced by the fact that we have time, a luxurious resource which most educators are not afforded. I love that we can say ‘throw all of those ideas down, we can look at them again later’ instead of having the pressure to produce something, something quite profound, and do so quickly.